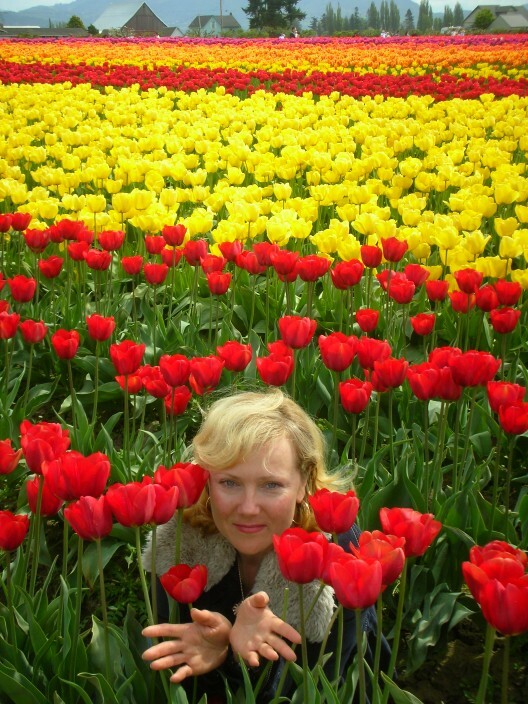 Can’t make it over the pond to the Netherlands to check out the spring tulips? Well, here’s the next best thing if you’re anywhere near Washington state. 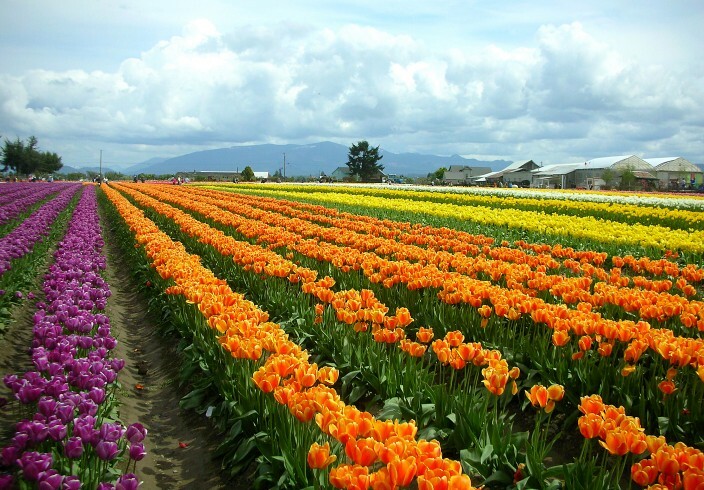 Located about an hour north of Seattle just off the I-5 corridor, near the small town of Mount Vernon, is the flat and fertile Skagit Valley. 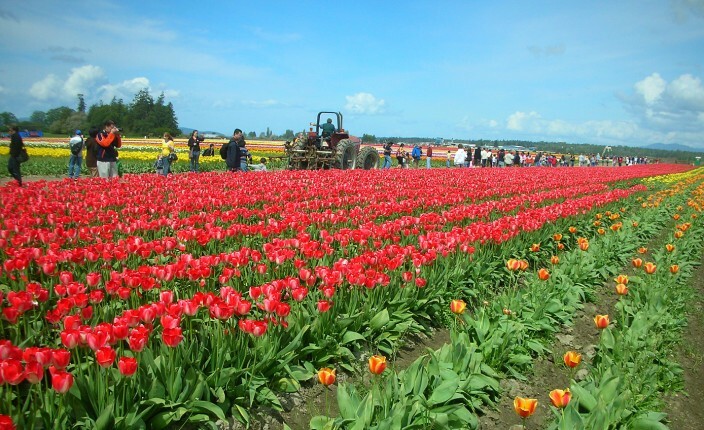 Every April this sleepy farming community comes alive and gets stampeded, overrun and generally trampled by hordes of gawking tourists/flower lovers flocking to the tulip fields. 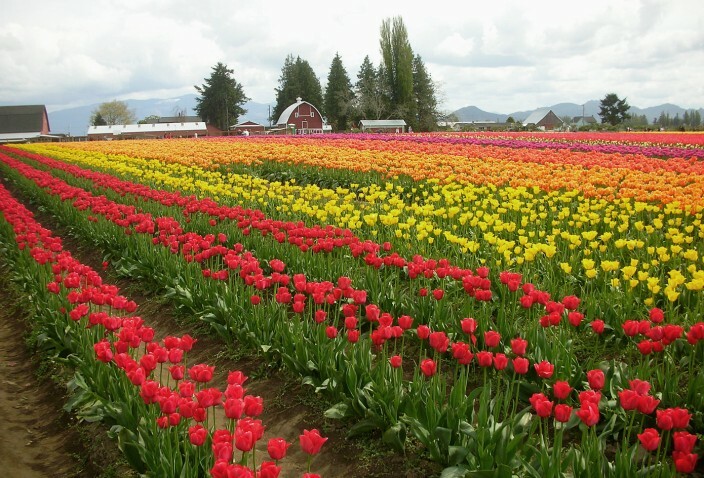 On display are a riotous rainbow of brilliant blossoms, a cornucopia of just about every possible color combination you could ever imagine, acres upon acres, row after row marching off into the distance, petals so bright they threaten to burn out your retinas. Heading north from Seattle on I-5, you’ll take the Mount Vernon exit #226 and head west through town. 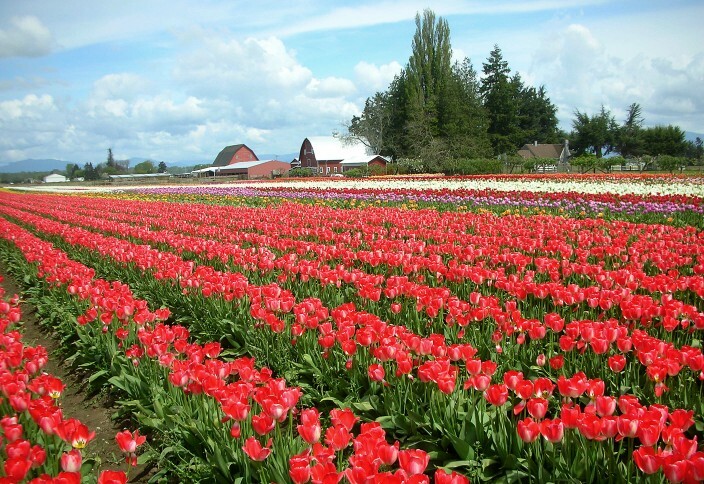 It’s three or four miles out to the big tulip fields, but there are signs directing you and anyway, just follow the bumper to bumper cars. In fact you might be able to park in town and walk out to the fields nearly as fast as the traffic sometimes crawls. Okay, I exagerrate, but it can feel that way. Showers are common this time of year (you know, April showers?) so don’t wear your fancy Sunday-best footwear. The fields can range from a little muddy to sucking-your-shoes-off-your-feet quagmires. Dress in layers (always a good idea in western Washington anyway) as you might start the day being hammered by a thundershower mixed with hail and ice pellets, then an hour later the sun pops out and temperatures soar. Come prepared for a bit of everything. Especially come prepared, if you arrive on a sunny April weekend, for BIG traffic delays and crowds. 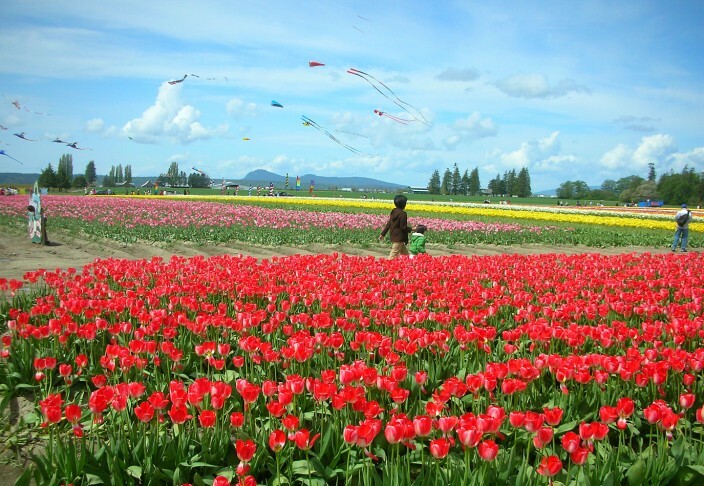 Your patience will eventually be rewarded, however, when you arrive at the two primary – and hence the most popular and most crowded – viewing fields, Roozengarde and Tulip Town. Parking is free, but make sure you park in a designated area. You will get a ticket if you park illegally. Naturally, my advice is to visit mid-week if you possibly can and avoid the humongous weekend crowds. There will still be lots of people mid-week too, but of a much more manageable number. 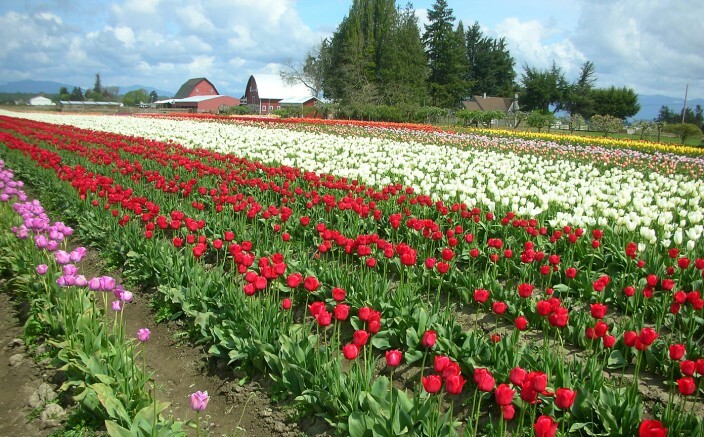 This whole thing officially got started back in 1984 when local merchants realized thousands of people were already driving around the fields looking at the flowers. So why not make it an official “event” and organize it? 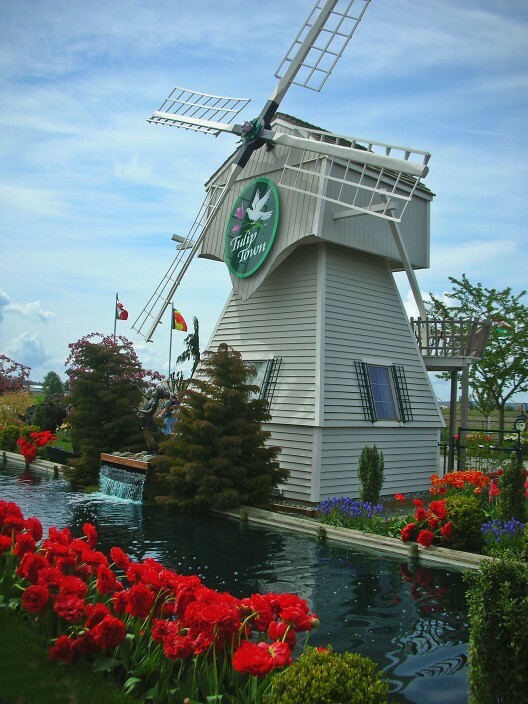 They did and it has mushroomed into one of the state’s biggest attractions. Hundreds of thousands of visitors come from every state in the Union and many foreign countries every year. 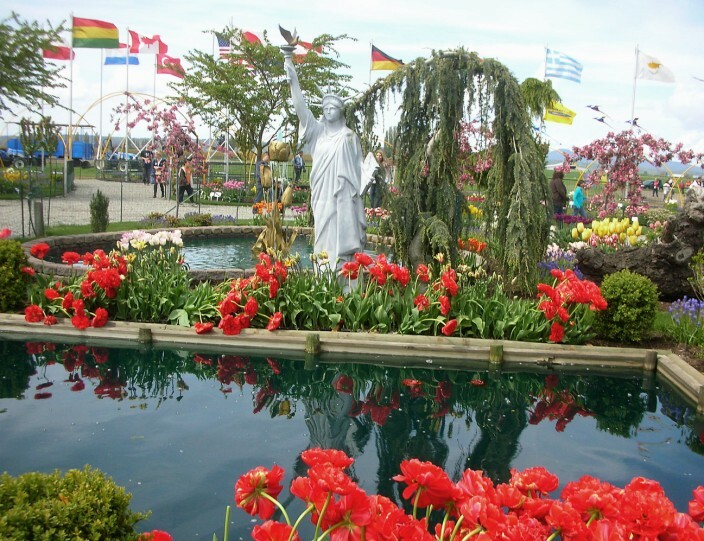 Besides just walking around looking at and taking photos of the tulips, there are lots of other actvities as well. 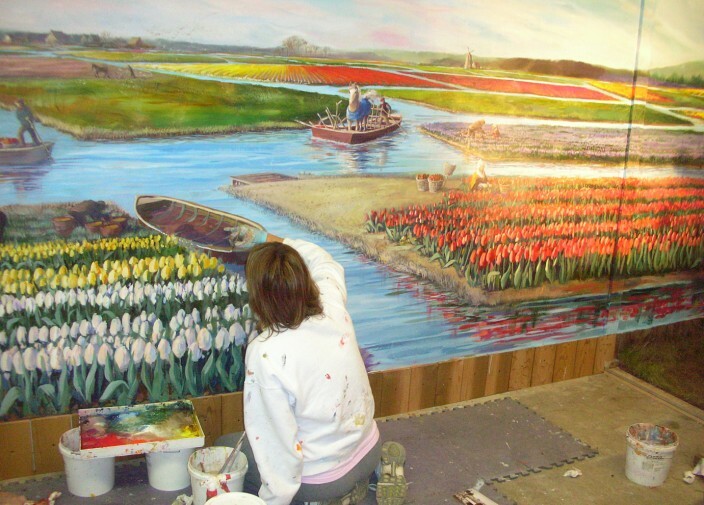 Art displays and contests featuring local artists, fun runs and bicycle rides, street fairs, concerts, a massive salmon barbecue and a whole lot more. 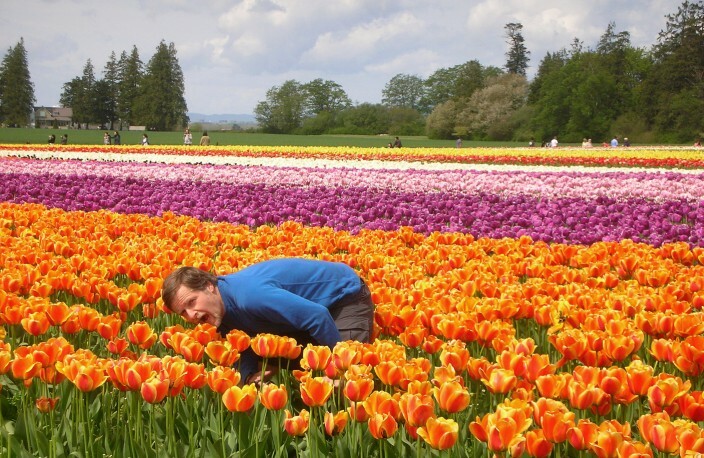 But mostly, there are tulips. Millions, methinks. They are ubiquitous, they are legion, they are inescapable. 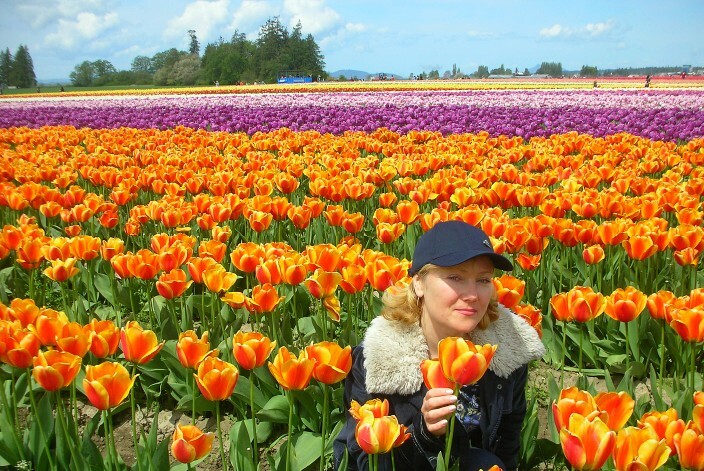 Naturally, there are fresh cut tulips for sale all over the place. 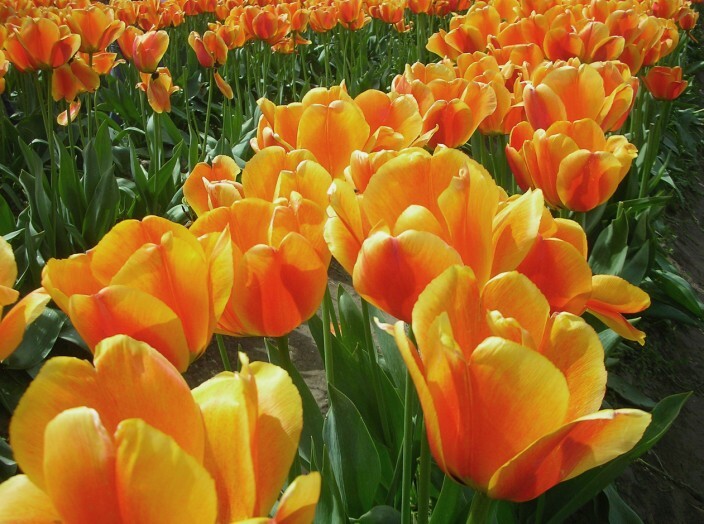 You will find tulips or tulip images everywhere and anywhere you look. 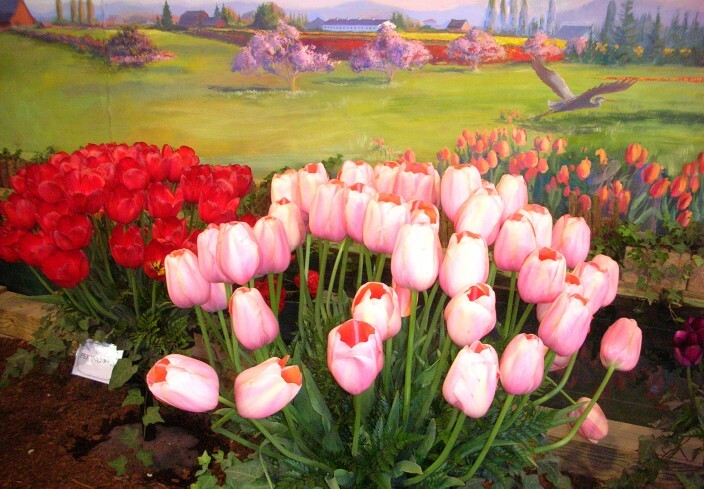 Tulip t-shirts, sweatshirts, aprons, underwear, coffee mugs, key chains, plates, glasses, posters, paintings, billboards, sunglasses, mouse pads, tablecloths, dish cloths and towels. I wouldn’t be surprised to find a tulip sandwich being sold somewhere. And when you’re finished with that, they probably have tulip toilet paper, too. I haven’t seen it but if not, someone is missing a huge marketing opportunity. 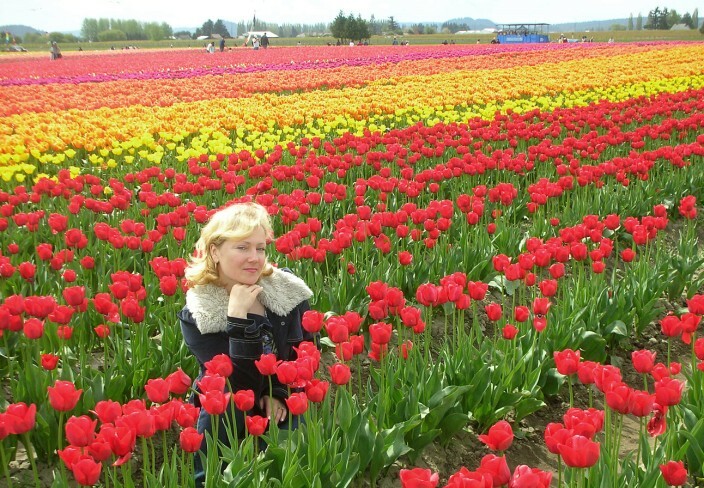 Aside from all the merchandizing frenzy, though, the best part is still just getting out there and strolling the fields of flowers. It really is quite an astonishing sight to see in person the sheer scope of just how many flowers are grown here. It’s a true delight to the eyes, almost a sensory overload of color. In one way it almost has an unintentional deadening effect. Go back to the “real world” after spending a couple of hours among the tulips and everything else looks rather drab and gray by comparison. A small price to pay, though, for so much beauty. If you’re ever in the area in April, it would be criminal not to come see it. Leigh, well you’ve seen Holland’s claim to fame and I haven’t so I guess we’re even. I’ve been through Amsterdam three times but never made it out of the airport! 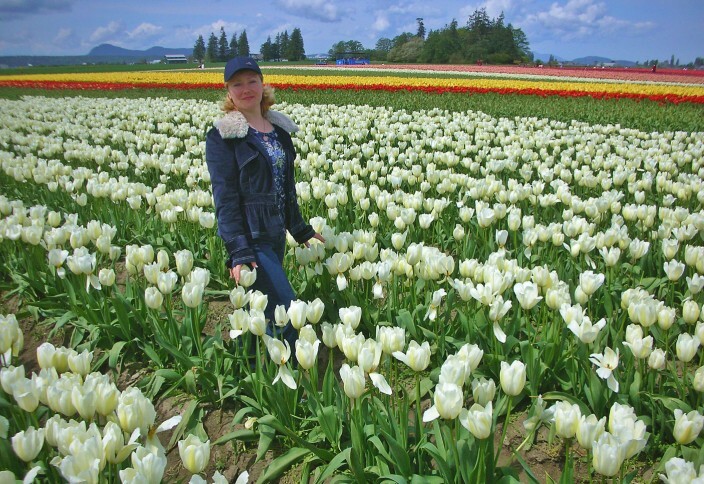 I’ve been to Holland when the tulips were blooming but I’m very sorry I missed a visit to the Skagit Valley especially when I loved in Vancouver. You’ve got some fabulous shots here.